Our semi-regular news round-up from the greenbelt between geoscience and technology. Our favourite volume interpretation tool, OpendTect, moved to version 4.4 in June. It seems to have skipped 4.3 completely, which never made it into a stable release. With the new version come 3 new plug-ins: Seismic Net Pay, Seismic Feature Enhancement, and Computer Log Analysis Software (right)—we're looking forward to playing with that. A new SEG event aimed especially at quantitative interpreters is coming later this month — the SEG IQ Earth Forum. Have a look at the technical program. Evan will be there, and is looking forward to some great discussion, and finding out more about Statoil's open Gullfaks dataset. On the last day, he will be talking about Agile's workflow for interpreting seismic in geothermal fields... stay tuned. We read in OilIT that US consultancy Ryder Scott has updated its Reservoir Solutions tools for Excel. These include Volumetrics, QuickLook Economics, Gas Material Balance, and LogWizard. If you try them out, do let us know what you think of them! Geoscience is perhaps a little slow picking up on the tablet revolution, but mobile apps are trickling out. We love seeing experiments like Pocket Seis, by Houston-based geoscientist-developer Jacob Foshee. And it's interesting to see what the more established software-makers do on these platforms... we think Landmark's OpenWells Mobile app looks rather tame. This regular(ish) news feature is for information only. We aren't connected with any of these organizations, and don't necessarily endorse their products or services. Except OpendTect, which we do endorse, cuz it's awesome. 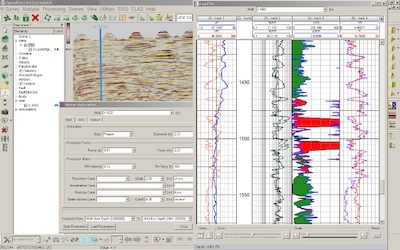 The screenshot from CLAS is a low-res fair-use image for illustration only, and copyright of dGB Earth Sciences.